My last day in Colorado was spent in the Grand Mesa area in the west central part of the state. It bears little resemblance to the rugged San Juan Mtns I had been surrounded by the past few weeks, and is not the sort of place out-of-state peakbaggers would make a point of visiting. I had more than a thousand miles to travel across the Great Basin back to California in the heat of summer and this was really just a wayside stop where I could sleep high and comfortably, and do a little hiking. The area is pockmarked with a hundred mostly manmade lakes around the 10,000-foot level atop this broad mesa, quite popular with fisherman, campers, OHVers and all combinations. The area is accessed via Hwy65 from Interstate 70 to the north or from Delta and US50 to the south. Leon Peak is the highpoint of Mesa County. Five and a half miles to the west is Crag Crest in adjacent Delta County, slightly lower but sporting almost 1,000ft of prominence. These were the two objectives I had on tap for today before continuing my drive west into Utah. I'd spent the night camped in the van just outside the Weir and Johnson CG, less than two miles from Leon Peak. A trail starts from the campground, and it was from here I started heading north around 6:30a. A few fishermen were up at this time but most of the campground was still sound asleep. The trail passes by Round Lake and a second reservoir before continues north past the east side of Leon Peak. I left the trail here to head northwest towards the summit for the last mile. Ducks appear to sort of mark the route, but they weren't really helpful as they do not lead up via the best route. The peak is a volcanic remnant composed of many acres of talus and boulders. Approaching from the SE as I did ensures the maximum amount of time spent in the tedious pursuit over the undulating terrain. It wasn't yet 7:30a when I reached the top where the wooden frame of a hundred yr-old fire lookout is found along with a benchmark. Constant lightning strikes forced the lookout's abandonment only a few years after its completion. The summit offers a superb 360-degree view overlooking the mesa, but the terrain itself isn't all that striking. The "grand" in Grand Mesa refers more to the size of the feature than its grandeur. I found a CMC register rolled into a nalgene bottle, the oldest I'd seen yet in Colorado, (though only) dating to 2000. I found a much better descent route, dropping off the NW side where I had only a short stretch of boulders to contend with. Once in the forest below, I found easier hiking in the trees circling around the peak on its north and eastern edges. I was back to the Weir and Johnson Reservoir by 8:15a, from where I struck off cross-country to the SE for the first of three bonus peaks. 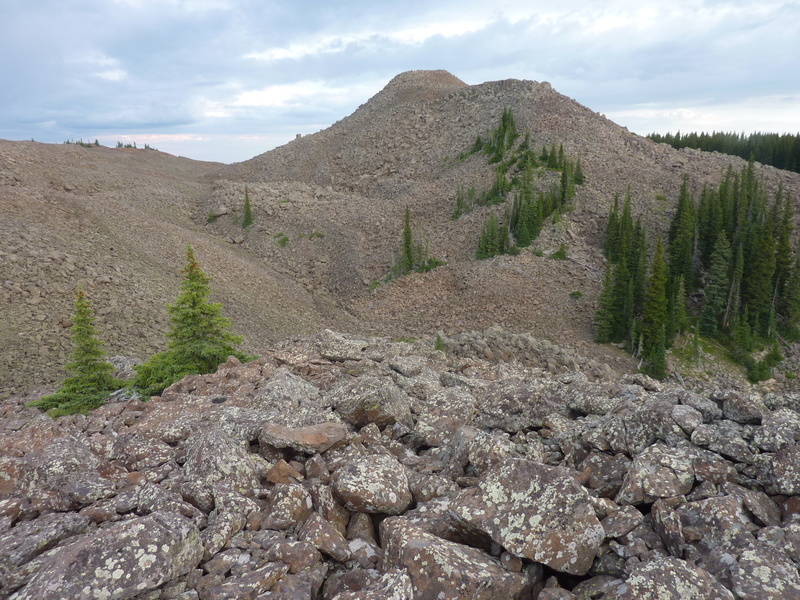 Unnamed Peak 10,855ft lies only 1/3mi from the campground, rising about 400ft from the surrounding forest and meadows. Like Leon, it is a volcanic pile of talus and rock, though not quite as extensive and a fair bit easier - about 30min for the ascent and subsequent return back to the van. After driving 3mi west along the route I'd originally come in on the day before, I stopped near Vela Reservoir, parked, and set off for two other bonus peaks in the area. I crossed the earthen dam forming the reservoir and hiked cross-country up forested slopes to the unimpressive summit of Peak 10,420ft where there were no views to be had amidst dense trees. A register had been left here in 2012 by Mike Garratt, whose name I recognized from a few days earlier on my hike to Storm Peak. Seems he's prone to leaving these all over the state. After returning to the reservoir and the van, I hiked northwest up to Peak 10,623ft about 3/4mi away. This one was a little craggier than the last, with the top having partial views off one side. Garratt had left another register here, too. Both peaks together took about an hour and half's time. I drove another 4mi west to the Eagleston Lake CG and the TH for the Crag Crest Trail. The trail makes reaching this summit a snap, nicely graded and maintained though talus fields that had no such help on the early summits. About 3mi one-way, the trail passes through forest and along several reservoirs in a northeasterly direction for about half this distance before abruptly turning west and climbing through talus to the ridge crest. There are fine views off both sides of the ridge as ones makes their way along the undulating trail to the highpoint. No register here, and the views at the top were partly blocked by evergreens on one side. I met several other parties along this fairly popular route. The trail continues another 2mi to the west before dropping down to Hwy65. One can make a loop of it by utilizing a lower trail. I was more interested in getting on with the driving so I went back by the shortest route which was the way I'd come.